Ink is one of China’s most traditional art forms and possesses a long and rich history. It is a medium that is embedded and a central reference in Chinese culture. Traditional ink painting represents the true cultural heritage of Chinese people, and has persisted as an art form over the centuries. Contemporary ‘ink’ art has evolved out of the traditional use to display endless new possibilities. This has a great bearing on how the traditional medium of ink is recognized, and can be further popularized in the contemporary dialogue. China’s increase in wealth as a country has attributed towards a trend of more interest, collection, and support of the arts. Contemporary ink art has captured the imaginations of collectors and speculators in Asia and Europe, and gradually in China too. Chinese Ink painting has been setting strong sales at auctions such as Sotheby’s Hong Kong and New York. It has become in high demand in the art market. LAAS has showcased and highlighted Chinese contemporary ink art since 2013, over the years it has become one of the landmarks of the show. East Art Center is a private art museum from Beijing that has been devoted to the promotion and support of Chinese contemporary ink art since 2010. This museum will present a curated exhibition, The Mood of Ink, in LAAS in January. The Mood of Ink will feature a group of emerging and established Chinese artists, focusing on the abstract expression of the ink art. It will include the artist Bian Hong’s series of her New Abstract Calligraphy, Chen Honghan’s mixed medium, Fan Peng’s ink inspired by Chinese stone rubbings, and Li Hongzhi and Yuan Fuguo’s abstract ink paintings. Bian Hong, born in 1971 at He Bei, works and lives at Beijing and New York. She is both founder and pioneer of New Abstract Calligraphy in China. In China, calligraphy was regarded as the primary and highest form of art, even preceded painting. The brush becomes an extension of the writers’ arm, and thus his or her entire body. The artists’ stroke not only suggests the movement of the body, but also inner mind. It is about balance of control and energy, order and dynamism. Calligraphy has come to convey an essence of the individual artists. 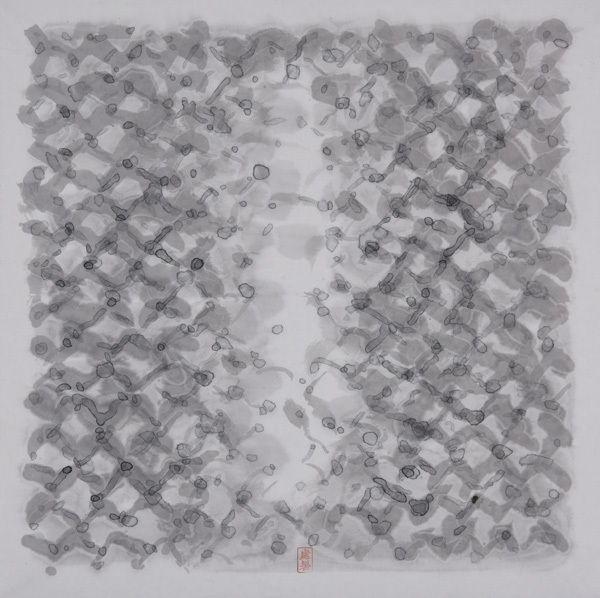 Bian Hong explores a space between traditional Chinese calligraphy and contemporary painting. The calligraphic brushstroke is used as an approach to abstract painting, focusing on the spontaneous gesture of the artist hand. It is known that Abstract Expressionist Franz Kline was inspired by the Chinese calligraphy. Cross-cultural influence is vital, if not inevitable, in art throughout history. Bian Hong has likewise, been influenced by the New York School and Western abstract expressionism through her traditional calligraphy. Her works have been closely connected to the Chinese philosophy Dao. The technique looks minimalistic, but it passes attributed through the philosophies of traditional ink painting, embodying the inner power and connection of mind, body, and spirit. Water and Wind will feature the ink landscape painting of two artists: Chen Jiu and Qiu Deshu. Chinese landscape of ink painting is called Shan Shui Painting. Water and mountains is the common subject. Chen Jiu, Director of Zhu Qizhan Art Museum & Shanghai Duolun Art Museum. 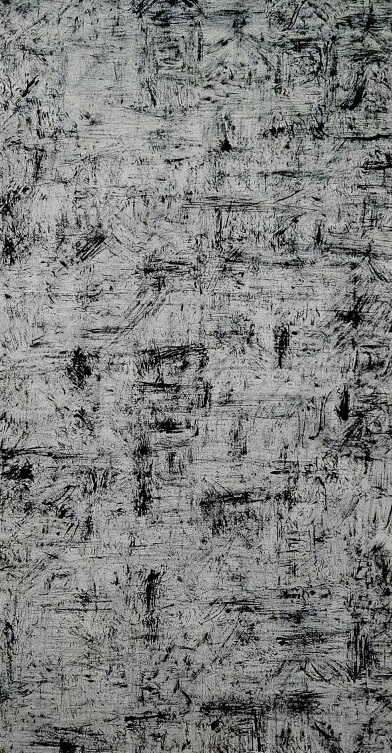 Chen’s abstract ink painting series are not simply an expression of line or ideology. It is instead a perception of the true physical status of water that goes between abstraction and reality. Chen depicts different states of water to showcase his meticulous skills towards the characteristic of the ink and his unique interpretation of water. It is an alternate interpretation of landscape painting. Chen takes inspiration from an ancient Chinese philosopher, Laozi, who was known for saying, “the greatest virtue is like water, which is advantageous to everything but not fighting for anything.” Chen studied water under different contexts, through the praise of water in The Book of Odes, to the observation of water under today’s micro technology. He takes interest and in the conservation of water and environmental resources. Chen Jiu turns his thoughts of water into the diversification of 24 Solar Terms. The artist explained, “…With a brush on my hand, I gaze at the gurgling water from a distance. I want to preserve the grace of flowing water with 24 Solar Terms: endless and boundless, the light skims over the water by chance. I aim to depict the special states of water with my interlacing brushstrokes.” Thus a graceful style of water is rendered into an abstract language with brush and ink. Qiu Deshu, is an internationally recognized artist that Cospace will present for the first time in LA. Contrast to Chen Jiu, Qiu’s subject is the mountain. Qiu was born in Shanghai in 1948, and studied a variety of traditional Chinese arts, including seal carving, scroll mounting, ink painting. In addition to traditional Chinese arts, he has also studied Western oil painting. He is known by his new technique called “fissuring.” Fissuring involves drawing with ink on rice paper, tearing it into pieces, adding and layering more paper, drawing or painting with acrylics, and continuation of tearing. The resulting texture appears as-relief with a sculptural quality with the layers of paper and paint. He feels it reflects not only his voice as an artist, but his life experiences as well. 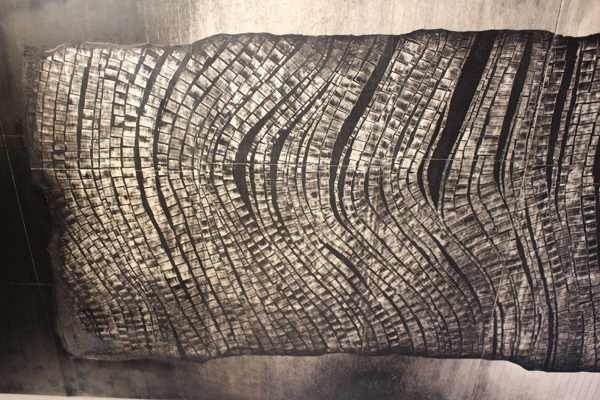 Qiu represents a generation of Chinese contemporary artists who since the 1980s have reclaimed ancient ink-painting techniques to create what is now known as ink arts. Shumoku Gallery will exhibit new sumi-drawing works, and some typical large pieces from the 1980’s, drawn by Sumi in charcoal and pastel. Shumoku presents Post-war Japanese contemporary painters, photographers, and young contemporary artists. Katadoru, this is the title of Shoen Tominaga’s main works ( his ambition) and it’s his life works. Katadoru literally means the appearance of things. But for him, it means reshaping and modeling his hand stroke performance. 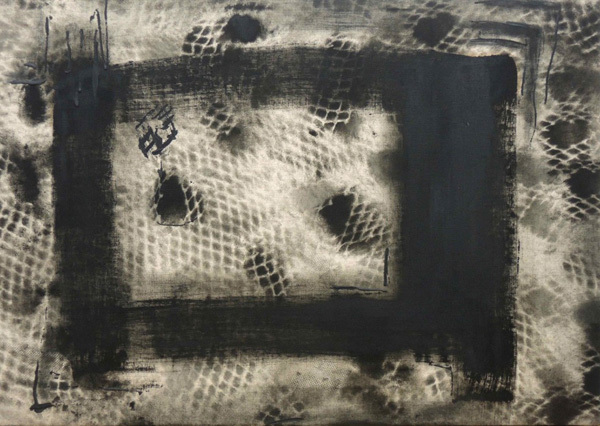 Born in Nagoya in 1929, he devoted himself initially to avant-garde and abstract art. 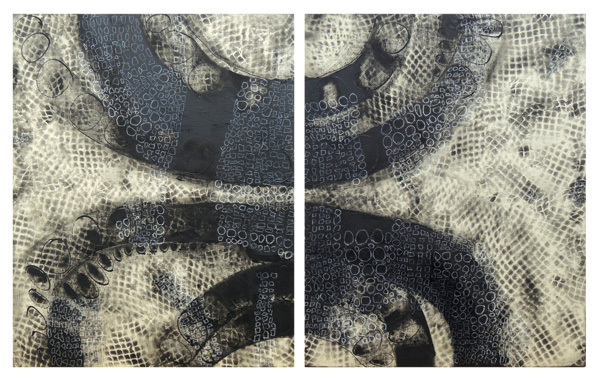 His work is influenced by Ancient Chinese characters, Japanese Zen-Temple calligraphy and Jackson Pollock. In 1952, he was invited to join the Bokujin-kai (Ink Human Society) by Shiryu Morita, Sogen Eguchi, and Yuichi Inoue, where he started to exhibit and publish work from the first issue of its journal. He presented his work at GENBI-TEN in 1955 with important members of Gutai, and in 1956 he joined the Neo-calligraphy exhibition in California. After leaving the Bokujin group, he continued to value the spirit of calligraphy and ink above all else. 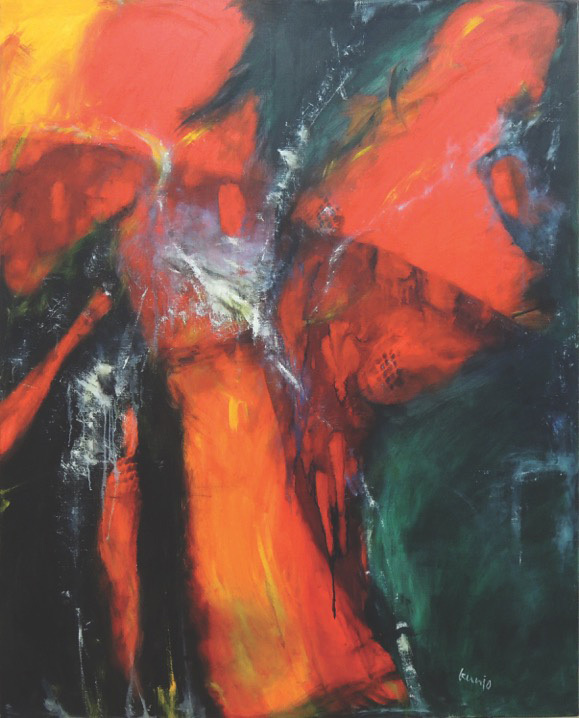 From the 1960’s to 2000’s he created a wide range of work, from drawings to collage and stainless art, based on his calligraphy studies and interchange with other contemporary artists. In recent years he has returned to ink art and produces his own works exploring the calligraphy necessary for contemporary work. Vision and Existence: The “Vision” series of Kunio Abe’s work is like scenery you see looking through a microscope and then what appears on the canvas. The “Existence” series is contrasting works of the “Vision” series. The principal theme in both series are the same. Abe expresses circulation of positivity and negativity, or nothingness throughout his creations. 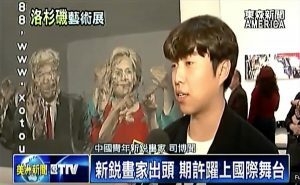 The Silk Road Art Gallery opened in March 2014 as a project of ArtPlus LLC, the American subsidiary of Xi’an-based Golden Earth Art. Liwen Ma (马俪文) the President and CEO of ArtPlus and Golden Earth Art, has been collecting pieces, displaying artwork, and building relationships with contemporary Chinese artists for nearly 15 years. Ms. Ma holds a Master’s in Art Design from the College of Art at the University of Northwest China and a degree in Chinese Painting from the Xi’an College of Fine Arts; she has also been a visiting instructor at the Art College of the Xi’an Technological University, where she has taught Art Appreciation, Art Collection, and Market Research. We have a longstanding working relationship with some of China’s finest contemporary artists. Our galleries in China have displayed the works of various modern masters, including Liu Wenxi, creator of the portrait of Mao Zedong found on the modern Chinese 10-, 20-, 50-, and 100-yuan notes. 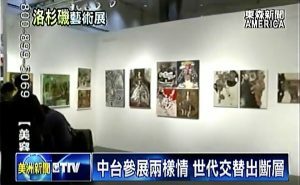 Single paintings by Mr. Liu have recently sold for as much as $300,000 at auction. We work hand in hand with contemporary masters of painting, calligraphy, sculpture, engraving, and more to collect, promote, and exhibit artwork in a way that brings success to artists, joy to collectors and the public, and satisfaction to our employees and shareholders. 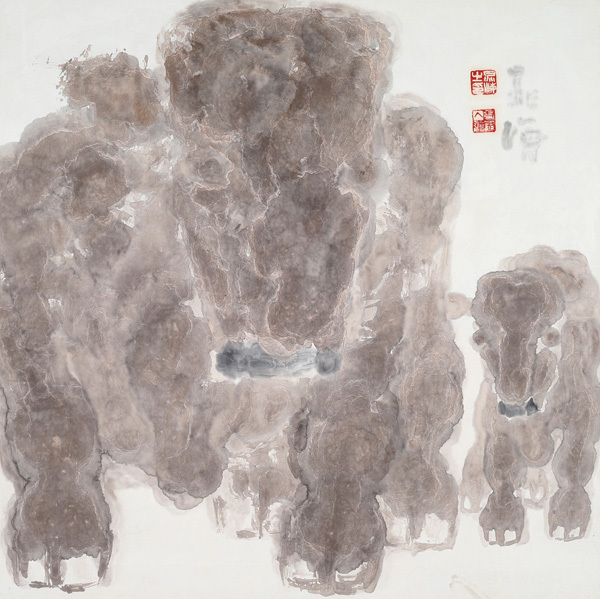 Born in 1955 in the province of Shaanxi, the influential Chao Hai has become on of the most prominent contemporary Ink and Wash painters in China. After graduating from the Xi’an Academy of Fine Arts in 1977, he started to perfect his unique style. By 1998, Hai was being shown in every major art gallery and museum throughout the county. Now a respected international artist, his work is an articulation of the heart of China– the life of the farmer. His unique brush work and layering of ink is a direct expression of the labor-intensive lifestyle that can consume rural life throughout the nation. His works are of rural settings, ox, horses and other animals. It is his hope to capture the spirit and desolation that comes with living in these communities. This is best demonstrated by his cloud-like brush work and the ability to display a figure without borders or shape: to capture the essence rather than a literal interpretation. While the tone of his pieces may be one of history and wear, there is always an underlying sense of pride and strength exuding from his work, dignifying his subjects without sacrificing the validity of its circumstance. His technique, in contrast to his tone, is contemporary and innovative. Hai has been a huge influence in the Chinese art world, expanding the scope of ink and wash painting as a medium, while at the same time showcasing the ability to capture the backbone of Chinese life.